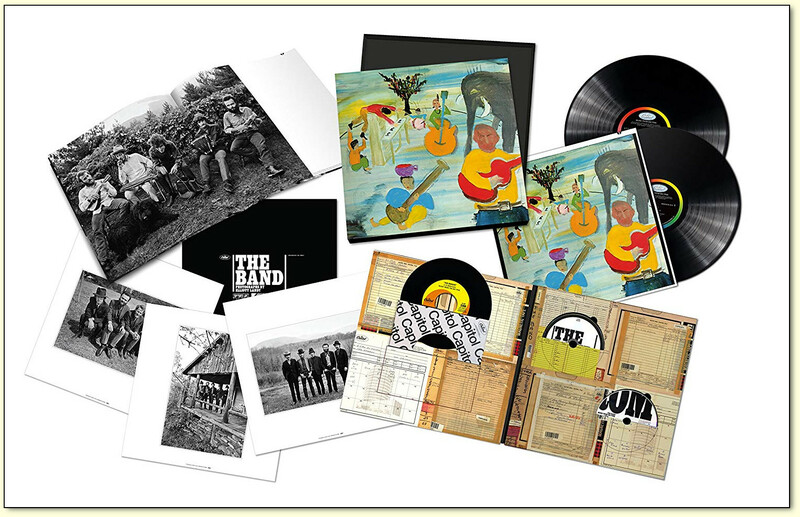 Remixed and expanded box set version of the Band's debut album, released by Capitol/ Universal Music Enterprises in 2018, 50 years after the original album came out. The ultimate review of this release can be found at the legendary Peter Viney's blog site. In celebration of the 50th Anniversary of The Band's landmark debut album, Music From Big Pink is released in a Super Deluxe (CD/Blu-Ray/2LP/7-inch) box set. All the Anniversary Edition configurations feature a new stereo mix for the album, produced by Bob Clearmountain from the original four-track analog masters, achieving a striking clarity and incorporating some previously unreleased chatter from the studio sessions. The 50th Anniversary Edition box set also includes five outtakes and alternate recordings from the 'Big Pink' sessions and a previously unreleased a cappella version of "I Shall Be Released." Exclusively for the box set, Clearmountain has also produced a new 5.1 surround mix for the album and the bonus tracks, presented on Blu-ray with the new stereo mix in high resolution audio (96kHz/24bit). All the new audio mixes have been mastered by Bob Ludwig at Gateway Mastering. The box set also includes an exclusive reproduction of The Band's 1968 7-inch vinyl single for "The Weight" / "I Shall Be Released" in their new stereo mixes and a hardbound book with a new essay by noted music journalist David Fricke and classic photos by Elliott Landy. For the LP, Chris Bellman cut the vinyl lacquers for the album's new stereo mix at 45rpm at Bernie Grundman Mastering, expanding the album's vinyl footprint from one LP to two.